This is a relatively new strain Imported fresh from Indonesia. 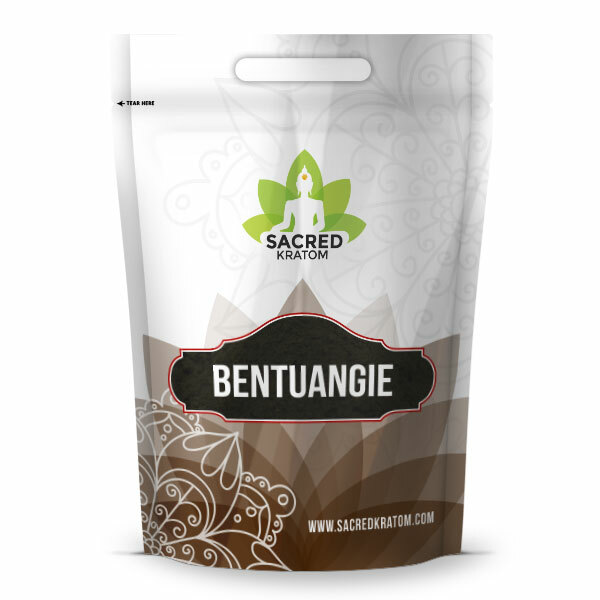 Bentuangie is a type of Kratom fermented in a bag instead of the usual drying process with other types of Kratom. The fermentation process is said to give this strain a unique flavor and a enhanced alkaloid percentage. Due to popular demand, we decided to start importing it and the response has been amazing. Currently, this is the most popular and sought out strain we carry, and it is selling like hot cakes! Bentuangie is a very powerful red strain coming from Indonesia, and it is named Bentuangie because of the area of the jungle where it is harvested from. Leaves are hand picked, stem is removed and the leaves are ground up to the consistency of powdered sugar along with most of the vein. Bentuangie is one of the most well rounded strains because of its natural tendency towards high content of 7-hydroxymitragynine. This was a little light for me. Aroma was pleasant but I’m used to good ol mang. I loved this kratom! I just wish it didn’t cost so much! You’ve gotta try it! I am removing a habit. Kratom helps! Will be ordering this one again. Great results. First time with this one and quality and effects are AS advertised. This was my first time ordering the Bentuangie and also my first time ordering through Sacred Kratom. The kratom through Sacred Kratom has some of the best aromas. Totally recommend to anybody, especially those who suffer from chronic pain. The aroma is subtle and it’s effective in relieving pain. I will definitely be ordering more. Love bentuangie. Definitely my favorite strain. First time trying this one and so far its great. Small delay in shipping but they took care of me well. I’d say this was good quality but for the price I was hoping for a bit more bang for my buck. I have somewhat of a high tolerance though unfortunately. In my opinion, this is the best that I have tried. Very effective. Thanks for offering this product. It’s a lifesaver. One of the many st potent strains I have tried. Great product and quick shipping. Very potent and excellent RED. Taste is smoother than other REDs. Fantastic quality. The best bentuangie I’ve had. The previous batch of Bentuangie was the best Kratom I’d ever had. This batch is nowhere near as good. I had to throw it away. Love this product. Enhanced quality. Sacred Kratom is a great company to work with. Clean and effective. It tastes like chocolate, great aroma. A truly pleasant experience. I made an order over $70 and still had to pay shipping, that’s a big turn off for me, no option for free shipping at check out. Outstanding products so far however. This strain has the best aroma. I actually enjoy it! Hands down the best strain out there!